Each week, GoDuke.com and the Blue Devil Network will catch up with head coach Mike Krzyzewski to learn more about his thoughts on a variety of topics. This week, following another milestone becoming the all-time winningest ACC coach, Coach K discusses passing his good friend Dean Smith on the list and wanting to celebrate Smith’s accomplishments as well. It’s an astounding accomplishment — one that comes along with 40 years as a Division I head coach — and it’s impressive even to peers that have piled up hundreds and hundreds of wins themselves. So, what’s the secret to longevity in this profession? How can coaches stick around long enough (and win enough) to get to this point? USA TODAY Sports posed these questions to some of the sport’s most successful coaches. Need more Coach K? You can also head over to FOX Sports GO on Sunday to watch our “Coach K Cam.” We’ll have an isolated camera on Krzyzewski throughout the game Sunday, starting at 1:30. The live stream will be available unauthenticated, meaning everyone can head over to FOXSportsGo.com and enjoy the Coach K Cam regardless of their cable provider. 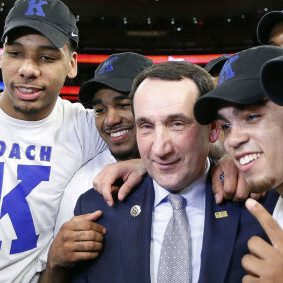 With head coach Mike Krzyzewski approaching his 1,000th career win, ESPN recently announced the scheduled presentation of a SportsCenter special entitled Coach K-1K. The program is set to air Tuesday, Jan. 13 at 11 p.m. (ET) on ESPN2, following Duke’s game against Miami. The one-hour special will include a round-table discussion, with former players such as Matt Brown (Army, ’79), Jay Bilas (Duke ’86), Christian Laettner (Duke ’92), Jeff Capel (Duke ’97), Nate James (Duke ’01), Jay Williams (Duke ’02) and Jon Scheyer (Duke ’10), as well as current player Quinn Cook. A Coach K interview is also slated for the piece.